I remember eating salad in my junior high cafeteria--shredded iceberg lettuce with mounds of ham cubes and pineapple all swimming in thick ranch. It was more like soup than a salad. Luckily, gone are the days when a salad means iceberg lettuce drizzled with a fat laden creamy dressing. Today's market shelves are well stocked with a wide variety of salad greens that can take your salad from ordinary to fabulous. Greens are not just "filler" for salad; they can add much of the taste. Get creative with your greens. Try to use several varieties in your salads. For convenience you can buy premixed mesclun, which contains a variety of greens. You can also blend your own by going through the produce department and mixing and matching greens. Some that will add interesting flavors to the mix are the slightly bitter chicories such as endive or radicchio, peppery arugula or even mild baby spinach. Look for interesting textures and colors in your greens as well. Maybe add some frisee or curly red leaf lettuce for extra dimension. For a slightly sweet, mild anise flavor, try adding some chopped fresh fennel bulb to your salad or use fennel as the basis of the salad itself. Here are a few different greens to try in your next salad. 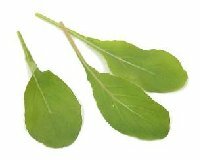 Arugula: With its peppery and slightly bitter flavor, arugula is a terrific green to throw into an otherwise boring salad. It can be gently braised, too. Some supermarkets sell it in small bunches, but you're more likely to find it combined with other greens in a spring salad mix. Belgian endive: These crunchy, slightly bitter leaves are often used to make hors d'oeuvres, but they can also be chopped and added to salads, or braised to make an exquisite (and expensive) side dish. Select heads with yellow tips; those with green tips are more bitter. Their peak season is the late fall and winter. 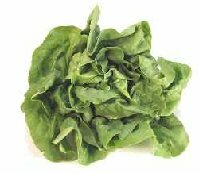 Boston lettuce: This is a type of butterhead lettuce, with soft, tender leaves. It's terrific in salads and sandwiches, or the leaves can be used as a bed for other dishes. Corn salad: Corn salad has tender leaves and a very mild flavor. 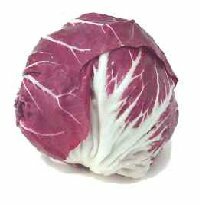 Radicchio: With its beautiful coloring and slightly bitter flavor, radicchio is wonderful when combined with other salad greens. You can also use the leaves as a base for hors d'oeuvres, or saut� them for a side dish. The most common variety, radicchio rosso (left), is round, while the treviso radicchio is elongated. • Why Do You Like Certain Foods?